It is that time of year again when school is back in session, so it is also that time of year when the senior portrait sessions start up in full swing! So to kick off the senior season Mike Wise Seniors is offering a “Back to School” special for only $20.12 for your first session. The session needs to be booked within August 17th and August 31st. It doesn’t need to be shot during that time but just scheduled. 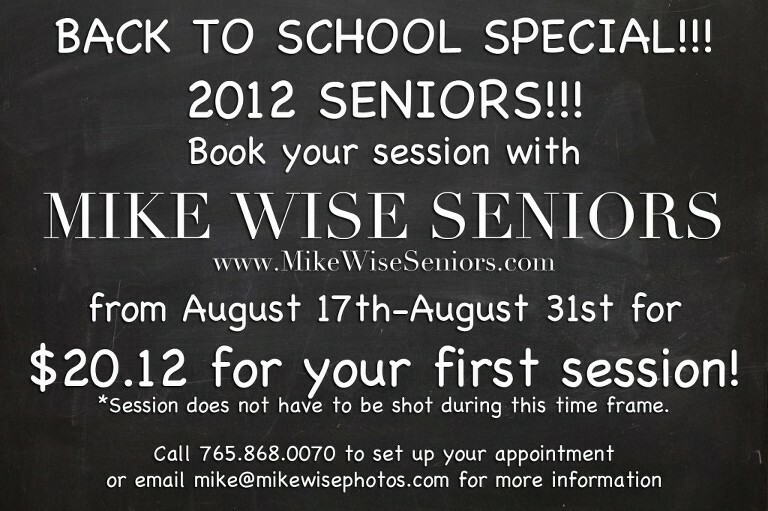 So either call 765.868.0070 or email at mike@mikewisephotos.com to set up your appointment today! Be sure to “Like” the Mike Wise Senior Photography Facebook page here for special offers and exclusive Fb promotions!